Properties in Ibiza average 4.6 out of 5 stars. NA SABINA BOHO HOUSE, Boho style deco Offer May !!! Property 10: NA SABINA BOHO HOUSE, Boho style deco Offer May !!! Two-storied house in old Ibiza town. Chill-out terrace with excellent views. Property 11: Two-storied house in old Ibiza town. Chill-out terrace with excellent views. Typical ibizan stone A/C country villa, with swimming pool facing sunset. Property 13: Typical ibizan stone A/C country villa, with swimming pool facing sunset. Typical Ibiza house close to the beach perfect for couples and families. 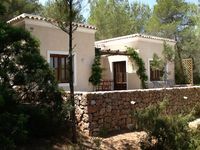 Property 15: Typical Ibiza house close to the beach perfect for couples and families. Portinatx apartment with stunning sea views! Best sunset or IBiza! Property 17: Portinatx apartment with stunning sea views! Best sunset or IBiza! Casa Columnas is atractive villa with a wonderful view to the sea . Property 26: Casa Columnas is atractive villa with a wonderful view to the sea . 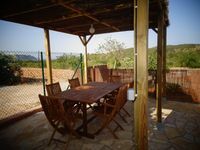 Casita with charm, rural and natural environment "ideal for families"
Property 30: Casita with charm, rural and natural environment "ideal for families"
Property 36: Countryside, ideal for couples. Elegant, vistamar, sunset, 5 min. Walking from the beach Cala Vadela Vadella. Property 37: Elegant, vistamar, sunset, 5 min. Walking from the beach Cala Vadela Vadella. Lourds and Pepe have created a lovely place with pretty well everything you need for a very comfortable stay. As we were here in January, it was certainly warm and sunny throughout, but maybe not quite hot enough to lie out on the patio or use the bbq. Our hosts are lovely people and were very helpful during our stay. Our only words of advice to anyone is to agree to meet L and P at the local village in San Carles, which is only a mile away. The property is impossible to find otherwise, particularly at night! Gorgeous - even in mid-winter!! When we first looked at this rental and saw no reviews for mid-winter, we were concerned as to how 'winterised' it was. The owners reassured us - and they were as good as their word. We were comfortably warm at all times. The weather also cooperated. It was a fabulous place and location to spend the New Year and Spanish Three Kings holiday. Spectacular views during daylight and a great kitchen to cook in after sunset - and at all times, magically quiet and peaceful. Obviously during longer daylight hours and warmer weather, the advantages of the beautiful swimming pool, the outdoor dining area and the two large front and back terraces would feature more, but it was still great to be surrounded by them and to enjoy the sense of space and light they contributed. All in all, highly recommended - and this is before mentioning the super friendly and helpful welcome of our hosts and their cute puppy!